With a substantial need for qualified employees in Southwestern Oregon’s truck driving industry, Umpqua Community College can now offer even more resources to students interested in the field thanks to a big-rig-sized donation. Make that two big rigs, actually. UCC announced in March that fundraising efforts, along with a donation from Daimler Trucks North America, an automotive industry manufacturer of commercial vehicles headquartered in Portland, resulted in the school’s truck driving program receiving two state-of-the-art big rigs. Fundraising efforts and industry donations have boosted UCC’s truck driving program fleet. UCC began work to boost the program’s fleet through an Umpqua Community College Foundation fundraiser. The foundation raised $46,000 for a truck through its annual Legacy Ball in November, according to a press release from the school. While shopping for a vehicle, local community partner Andy Owens from A&M Trucking reached out to Daimler. 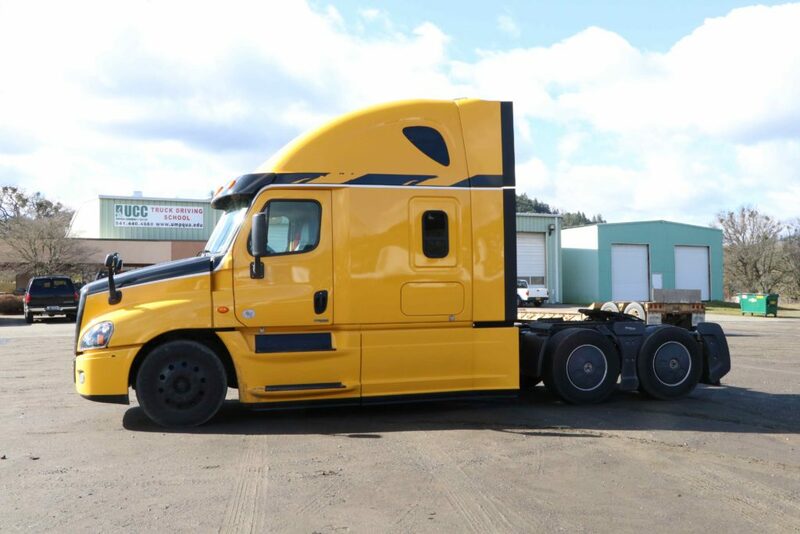 The company not only agreed to assist with the initial truck’s funding, it donated an additional truck valued at $80,000 from its corporate test fleet. Both trucks are 2015 Cascadia models. The trucks are equipped with new safety features and the newer technology drivers are expected to use on the job. The first truck was delivered to the college by Freightliner Northwest’s Mark Christie and Todd Tracy on Feb. 21. Freightliner facilitated the donation on behalf of Daimler. UCC’s second truck was expected to arrive in March. “The addition of an auto-shift to our fleet helps us train future drivers using state-of-the-art equipment,” she said. According to UCC, truck driving is currently one of Oregon’s most difficult-to-fill occupations, with 74 percent of vacancies located in Southwestern Oregon. To meet the industry’s rising demand, it is estimated 90,000 new drivers will need to be hired nationwide each year for the next decade. The college’s truck driving program has trained 30 to 50 students a year over the past five years. Once students complete the four-week program, their job placement rate has ranged between 87 and 95 percent over the past three years. VanWinkle said that industry champions from local truck driving companies have been working with Umpqua Training & Employment to increase the number of truck drivers trained in the area. Christie, Freightliner Northwest’s senior fleet account manager, lauded the partnership between educators and industry leaders. “This truly is a fantastic project and should be modeled around our dealer network and the country at large,” he said. The partnership between industry leaders and educators is an example of the work being done throughout Douglas County to “grow our own” workforce. UCC has taken a leading role in supporting careers in the trades, including recently holding a celebration for students entering its career and technical education programs to highlight the meaningful impact these pathways provide for students. Do you know of industry leaders who are supporting our local students? Let us know and we’ll highlight their work in a future Partners’ Post.